People of all ages and backgrounds decide to donate their time and effort to a charity for a host of reasons. Many want to give back in some way and to make a difference to others who may be less fortunate. Some volunteer to hone their skills or develop new ones. While others find the charitable work a departure from their business experience and enjoy the new learnings and perspectives that a non-profit can offer. Volunteering can be a route to employment, or a chance to try something new that may lead to a career change in the sector. At Lifeline Energy, we love volunteers! Volunteer and become a member of our extended team. There’s always a space for a committed person who can use their professional skills and knowledge help us out on a part-time basis. Become a member of our extended team. We have volunteering opportunities to work from home to help us with research, social networking, writing, working on campaigns, marketing, SEO, and more. Over the years, volunteers have joined us on radio and media player distributions in Africa as well. These experiences have become memories they’ll always treasure. 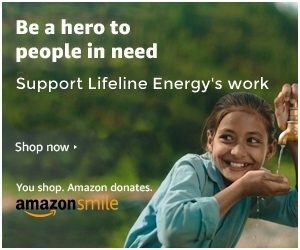 If you’re interested in learning more about volunteering for Lifeline Energy, just email us at hello@lifelineenergy.org. We’ll get in touch right away!